Can I start this review off by confessing something? I guess it is my review, so I can start off any way I want, huh? This is not something I really wanted to review. I didn't NOT want to review it either, but this just seemed like 'one more thing' to try to fit in, and it was not something I thought would have enough value to justify it. 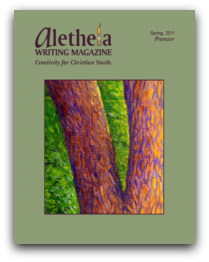 Aletheia Writing Magazine's fall issue arrived at our house, and was set on the island in the kitchen and basically forgotten about. I handed it to Connor (14) a week or two later and told him that I had something for him to read when he got a chance, as we had to review it in another couple of weeks. He looked at the cover, and put it in his school stuff. He clearly had an attitude about it. But I knew he would comply. A few days later I was gone for the day, and he had been told to get his schoolwork done OR ELSE. And practically before I walked in the door, he bowled me over and started gushing about how much he loved this magazine, and how he wanted to know if we could subscribe. So, what did you love about it, kiddo? And why do you want to subscribe? "I liked that the stories were written by teens," he said. That was his stock answer every time any of us asked about the magazine. But I did eventually get more from him. He enjoyed the stories. They seemed to address real things that real Christian teens think about. Not some sort of ideals as to what Christian homeschooling parents *want* their kids to think about. More real. The artwork is done by teens. The photos are done by teens. There are book reviews done by teens. And poetry by teens. There are notes after some of the stories mentioning other works, or scripture, or great quotes. And Connor's statement to me: Not only is this enjoyable to read, but it makes me think that I can write too. 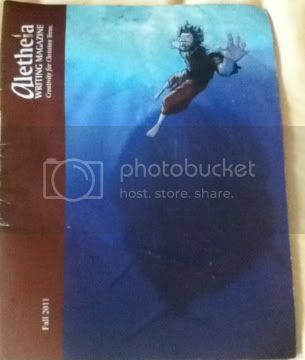 As part of the TOS Homeschool Crew, we also got digital access to the Summer 2011 issue. Connor loved that as well. He commented on how that issue was great because it had more variety in genres... the Fall 2011 issue being predominantly fantasy. Click the magazine cover and you can read it too. This was the first issue - Spring 2011. I am impressed with what this magazine has accomplished in just a couple of months. And we will consider subscribing. At $26 for a one-year subscription (in the US), it isn't cheap, but it is in line with what I've seen from this type of magazine. It inspires my kids. And that says a lot. Disclaimer: As part of the TOS Homeschool Review Crew, I did receive two issues of this magazine (one physical, one digital) in exchange for my review of the product. All opinions are my own, and receiving complimentary products does not factor in to my opinions. For more about my take on reviews, visit my blog post here. Sounds like we had similar experiences. I do really like that it is REAL. I'm thinking I might have to get Turtlegirl a subscription as a Christmas present.